The best home saunas not only look great in the home, but they provide a growing list of health benefits to the user. Regular sauna sessions are available if you join a full service gym, but there are some definite drawbacks to using a sauna in a gym. 0.0.1 The #1 reason not to go to a sauna at a gym..
0.0.1.1 The solution is to install a home sauna right in your house! The #1 reason not to go to a sauna at a gym..
Gym saunas are dirty and spread germs. They are unsanitary and there is no way around this. The wooden benches in the gym sauna are absorbent and dozens of people sit and sweat on these benches. This is a breading ground for germs and bacteria since bacteria love the warm temperature and damp environment. Gym saunas are rarely sanitized, if ever. Even if bleach were used on a daily basis the wood on the gym sauna would still be filled with dangerous illness causing germs below the surface of the wood. Many recommend that – if you don’t want to get sick – stay out of the gym’s sauna. So, we need to avoid the gym sauna if we don’t want to get sick and spread germs to our families. But the health benefits of using a sauna can’t be ignored. What is the solution? The solution is to install a home sauna right in your house! Weight Loss: For ages people used saunas to lose weight and lose inches. Many people argue that you only lose water weight and the weight loss effect of using a sauna is just temporary. But research now shows that you can burn off up to 600 calories in a 30 minute sauna session. Detoxification: The proper use of a sauna is a safe and efficient detoxification method. Sauna therapy expels harmful toxins, insoluble chemical residues and heavy metals from your body. Whole body detoxification is extremely important for overall health. Stress Relief: Many use a sauna to eliminate tension and remove tension from daily stress. We have first hand experience that this can work. Skin Care: Sauna therapy will renew elasticin-collagen tissues while crow’s feet, forehead lines, wrinkles, age spots, scars, varicose veins and stretch marks naturally fade away to make you look younger. Immune System: The use of a sauna will Increased production of white blood cells and toxin removal through sweating combines to improve immunity to help stop infections, flu, sinus issues, and other ailments. 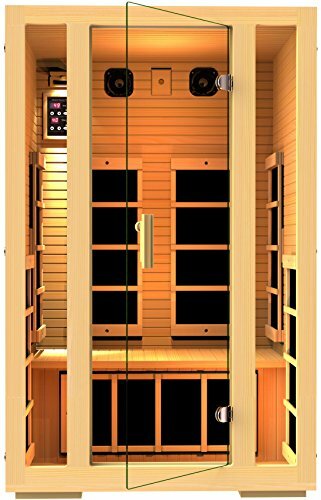 This JNH Lifestyles sauna tops our list of the best home saunas in the $1000 price range. It comes delivered from Amazon in three flat but very heavy boxes. The weight of the boxes alone will tell you that this sauna is well built. Here are the boxes that we received. 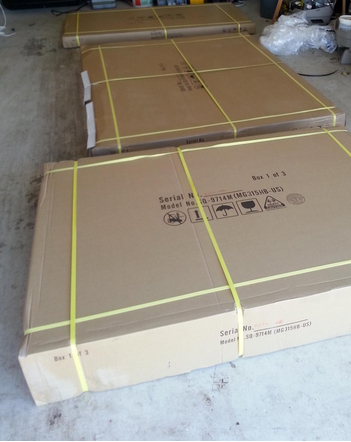 You will need two people to move these boxes because they are almost 100 pounds each. The delivery person earned his money on this day! The assembly of the JHN Lifestyles sauna was as expected. After you get the boxes to your assembly location it only takes one person and less than 2 hours to put the whole sauna together. This assembly instructions are surprisingly easy to follow. The English instructions are written well and are clear. There are only really 6 main wood pieces for the sauna – one piece for the top and the bottom and then the door and 4 sides. The structure of this sauna kit snaps together quite easily and the connections are quite secure. 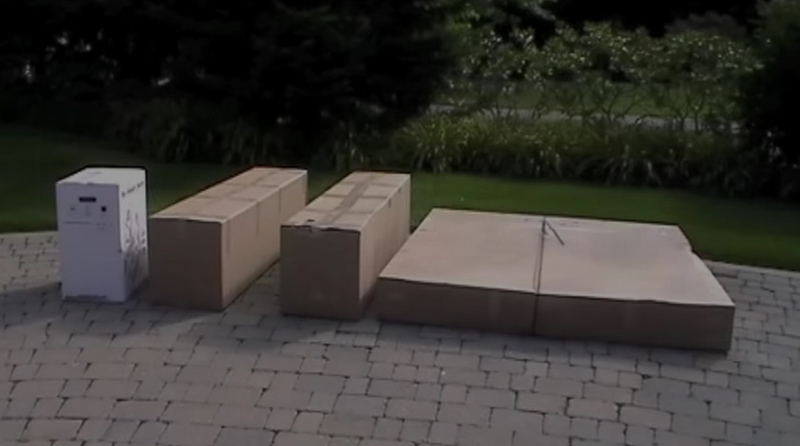 You need to assemble the bottom, the 3 sides, and the top, then you install the electrical wiring connections and finally the bench top. Lastly, the front door portion of the sauna gets installed. If you are not accustomed to doing this type of work then you may want to hire a professional to do the assembly. Just for fun, I looked around for some pricing on this type of assembly work. I could hire a local handyman to put this together for around $300 in the Washington DC area. It would likely be less in some other areas. Here is a photo of the base and the first wall connected. There is no need to have any electrician skills because this sauna kit has all of the electrical components pre-installed in the panels. 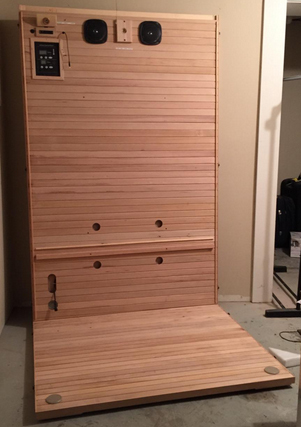 After completion, the sauna is ready to go – just plug it in and let it heat up for about 15 minutes or so…. There are a number of features that we really like about this JNH Lifestyles sauna model. The heating unit is quite efficient and will heat up to 140 degrees within about 15 minutes. For infrared sauna technology this is a pretty nice temperature. Traditional saunas (electric) have a higher temperature range, but for in home use 140 degrees delivers an excellent experience. Most sauna users will start at a lower temperature and eventually work up to the high temperature 150 degree range. 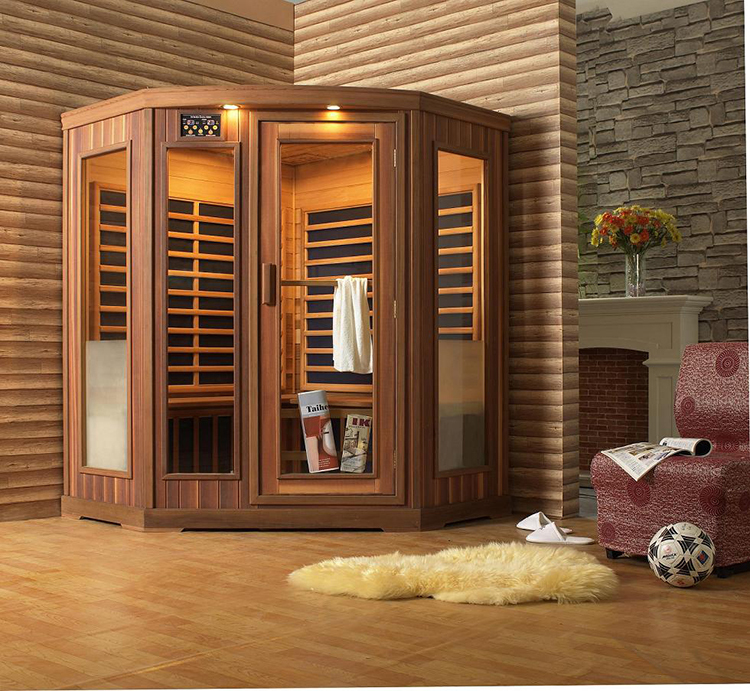 Why did this make our list of the best home saunas in the sub $1000 range? The JNH Lifestyles Sauna is well made. The unit uses quality components including the panels, the electronics, and the heating system. This home sauna is easy to assemble and well engineered. The sauna is sized perfectly for the home and is very comfortable for 1 person or 2 if they know each other well! For the price, you will not beat this sauna experience. Quality at an affordable price. We will continue to add detailed home sauna reviews to this list of best home saunas over the next coming weeks. Be sure to check back with us to find out our latest recommendations! 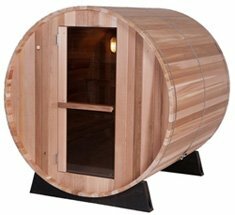 If you would like to get the best home saunas for the money – in the $5000 price range – then you will not beat the Almost Heaven Barrel Sauna. Note that this is not an infrared sauna. This is the traditional steam sauna type. The heating element heats up Amphibole rocks and you can add water to to make steam. These saunas use more energy but they can get hotter and make real steam. 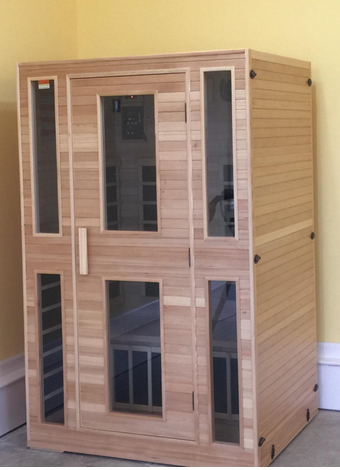 You will not beat this sauna experience with an infrared sauna model. 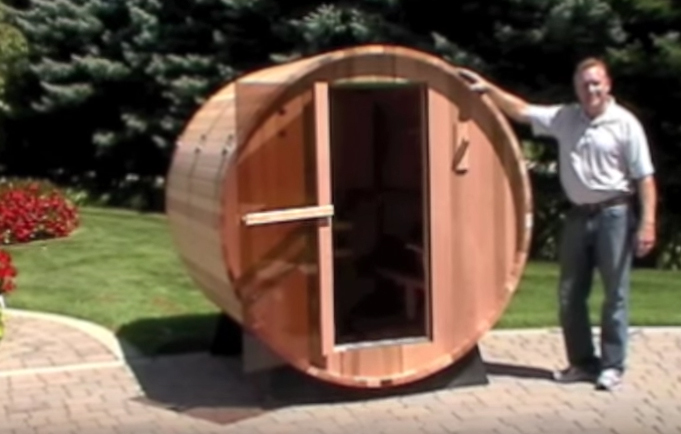 This sauna is HEAVY – it comes in 4 boxes that weigh a total of over 300 pounds. The delivery man will bring it on a truck with a lift on the back and they will leave it in your driveway. It is up to you to get 3 or 4 strong guys (or gals) to take it inside your garage or assembly area. 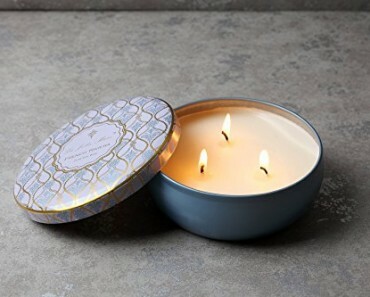 Alternatively, you can open the boxes outside and bring the pieces in. In our case, we kept it outside in the driveway and built it outside. The white box contains the heating electronics and the other boxes contain all of the wood and hardware for the sauna. 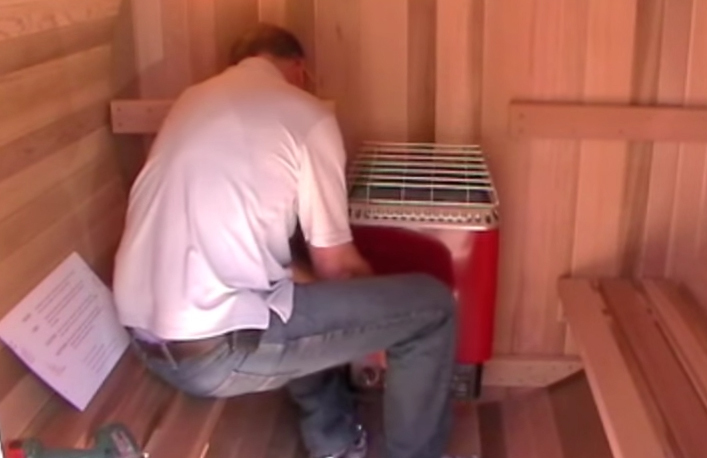 Assembling this home sauna took us a while, but the instructions were easy to follow. While it is possible, doing the assembly by yourself would be quite challenging. At minimum, you should have someone available to give you a hand when it is time to put the large round end pieces – the door and the back – into place. For this Sauna there are many pieces because the boards that make up the round walls of the sauna are put into place and nailed one by one. After all of the boards are in place you will place metal straps around the entire structure and tighten. 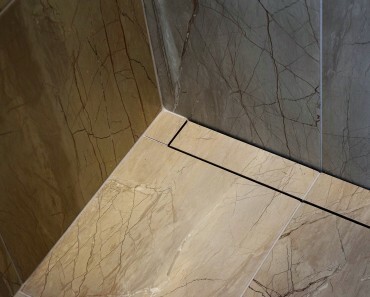 This makes sure that this sauna will never fall apart or loosen with the heat and steam. The heater assembly is bolted to the back inside wall of the sauna. It looks a little cramped inside but we found that this is the perfect size for two people. The 6′ model is a nice size, but the company also manufacturers an 8′ model if you are looking for a larger sauna. And here is the completed Sauna – A work of art! Here are the things that we love about this home sauna – why it is on our list of the best home saunas. 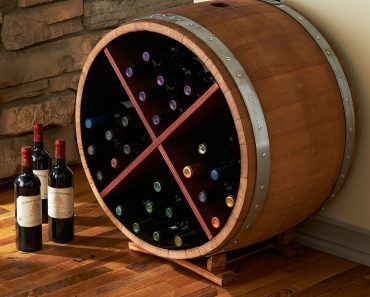 The design – This unique round sauna barrel design is sure to catch the attention of your guests. It is unique and well built. The sauna can be kept outdoors – and we think it should be. The stand is made of a heavy plastic type of material that can sit on the ground or driveway and will not be bothered by water. Over time the color of the sauna will change if you leave it outside, so the manufacturer suggests that you stain it with an outdoor stain in order to protect the color. There is plenty of room inside. 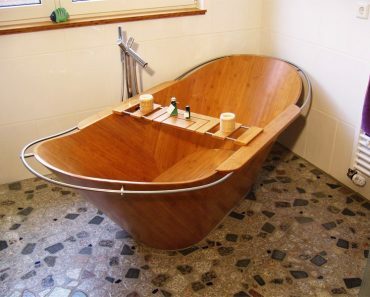 This sauna is a the perfect size and not too cramped.